How can I best view the Orionids meteor shower? If you live near a brightly lit city, drive away from the glow of city lights and toward the constellation from which the meteors will appear to radiate. For example, drive north to view the Orionids. Driving south may lead you to darker skies, but the glow will dominate the northern horizon, where Gemini rises. Perseid meteors will appear to "rain" into the atmosphere from the constellation Gemini, which rises in the southeast around 11 p.m. in mid-October. Waning Gibbous. Orionids shower gazing conditions will not be ideal. The moon will obstruct all but the brightest Orionids. History of Orionids coming soon! The Orionids meteor shower has been observed for nearly 200 years, with the earliest sighting credited to E.C. Herrick of Connecticut, who in 1839, was the first individual to state that there is meteor activity annually around the 8th and 15th of October. Orionids is one of the top meteor showers to observe during the 4th quarter of the year, producing up to 20 green and yellow meteors per hour during its peak.Orionids meteors are also known to be speedy, with meteors soaring through the night sky at approximately 66 km/s (147,638 miles per hour)—ninja reflexes are required to capture the magic on camera. Autumn is in full force in the Northern Hemisphere, and that can only mean that the peak of the Orionids meteor shower is quickly approaching. This annual celestial event is the most prolific meteor shower associated with Hailley’s Comet and the second of two showers (the first being ETA Aquarids) that occur due to the Earth passing through the dust of the famed comet. In fact, most meteor showers are the product of Earth passing into the dust particles of a comet. Many thousands of years ago, Halley’s Comet left a trail of dust behind as it traveled through space. The Orionid meteor shower takes place when Earth travels right through that trail of dust and debris every year. What appear to be shooting stars are actually tiny grains of dust burning up in Earth’s atmosphere. 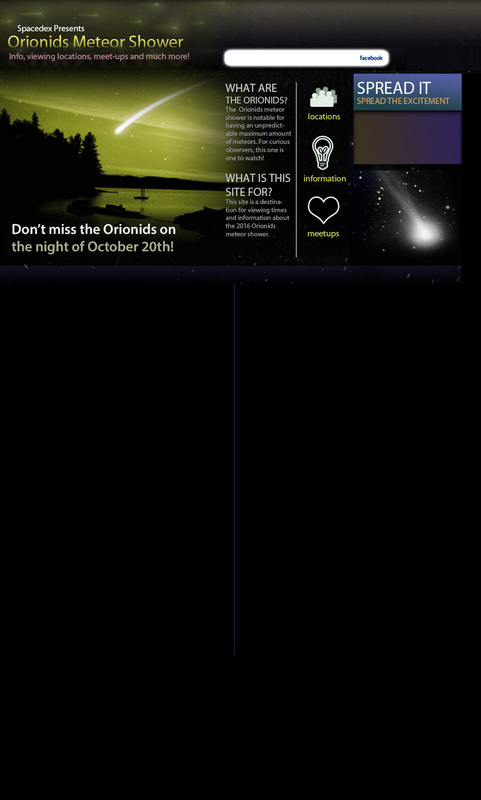 While the Orionids may be active from October 2nd through November 7th, it is strongest on the night of October 20th, and into the morning of October 21st, when it will peak. The peak of a meteor shower is the moment of the strongest meteor activity, and the number of meteors during this time is expected to range from 15 to 25 meteors per hour under ideal viewing conditions. As with many meteor showers, predicting the peak of the Orionids is difficult; we’ve seen an upwards of 40 meteor showers per hour during various years, while other years have seen a modest 5 during peak hours. In 2016, the Orionids peak will occur during the Last Quarter Moon (50% full). Due to this, viewing conditions will not be favortable this year. Meteor shower devotees may still glance up at the sky—as these fast moving meteors are capable of leaving persistent trails and unforgettable bright fireballs. The radiant of Orionids, also known as the point from which all of the meteors appear to come from, is the “club” of the famous constellation Orion. Not by accident, the Orionids meteor shower is named after the constellation Orion due to this fact. The club is located at a point in the sky not too far from Orion’s red giant star Betelgeuse. While waiting for shooting stars to fall, you will notice the brightest star in the sky, Sirius, to the lower left and east of Orion. The Last Quarter Moon will be rather thick, so it is likely that fainter Orionids meteors will be washed out by the bright moonlight. Be aware that local conditions such as cloud cover, light pollution, and precipitation will also play a major role in the number of meteors you are likely to see. Once you have settled down at your observation spot, look approximately half way up the sky facing southeast. This way you can have the Orionids’ radiant within your field of view. Looking directly up at the sky or into the radiant is not recommended since this is just the point in which they appear to come from. You are more likely to see a trail when looking slightly away from this point. Looking half-way up into the sky will lead to the best show in the house! Spacedex wishes you and yours a magnificent viewing experience tonight! Last Quarter Moon. Orionids shower gazing conditions will not be favorable. The moonlight may interfere with viewing. Name origin: Appears to radiate from the constellation Orion.